Only one little inconvenience left. I have Facets with 2 panes and every time I start foobar the second pane doesn't load. When I set the second pane to Title, then it loads everytime, but with Folder or Album it doesn't load. Sometimes it loads when I make a dosen clicks in the first pane, sometimes not. When I want to see the content of the second pane, then I have to change the columns filtering. It even doesn't show the name of the filtering, but in the menu it's activated. Is there a fix for that? I noticed something similar happening to me, does it load if you resized the panel that is blank? So it's a common bug/problem? Many use Album Artist = VA or Album Artist = Various Artists for compilations. Artist = individual track artist name. Filtering on VA is then simple. I'd still get all the tracks that are (feat. Pit Baccardi) from other artists. Is it possible to show results only if the string shows up in the directory name ? There should be an Album Artist option already, right click your Facets where it says Artist, goto Columns and it's under there, at least it is on mine. I am using Facets. After upgrading to 1.1.11, all my column panes have lost the ability to have bottom scroll bars even when the text is wider than the window. How do I get them back? here i tried a snippet that won't work but leaves to an empty pane. Maybe a bug? Making it work would be a interesting feature to achieve compatibility with other players. Hi guys. Putting Foobar2000 on a new computer, want to restore my old setup. It looked like this, and everything's good so far. However, I can't work out how to get my old main Facet back. It looked like my recreation in the top-right. All of the songs were listed in alphabetical order by artist, and then in alphabetical order by album, and then in sequential order by song. The songs listed duration and bit rate on the far right (year as well, but not pictured). I was able to click on the top area to choose which direction to sort artist in - A-Z or Z-A. The issue is that I can't figure out how to get that setup back for the life of me. Anyone able to help? Wishlist item. Don't know if this is a facets specific. I sort by folders, so I add 'superfolders' to the library. Like E:\1, E:\2, F:\3. Then displayed are the subfolders of these three. Say, in F:\3 I have a F:\3\_Various_Artists , and I want to have the subfolders of this displayed too. I could of course move that from F:\3 to F:\, but I would like to just add it to the library: If F:\3 and F:\3\_Various_Artist are both monitored, then as of now, the latter makes no difference. I'd like to have the addition of a subfolder to overrule. Huh. Restarting and it worked that way? Puzzling. Sorry. Does anyone have a problem with having album cover to show up on several albums? I noticed that several of my album art doesn't show up. All are named folder.jpg. Nothing big deal but just wondering. Is there a way to display the total number of albums or tracks? 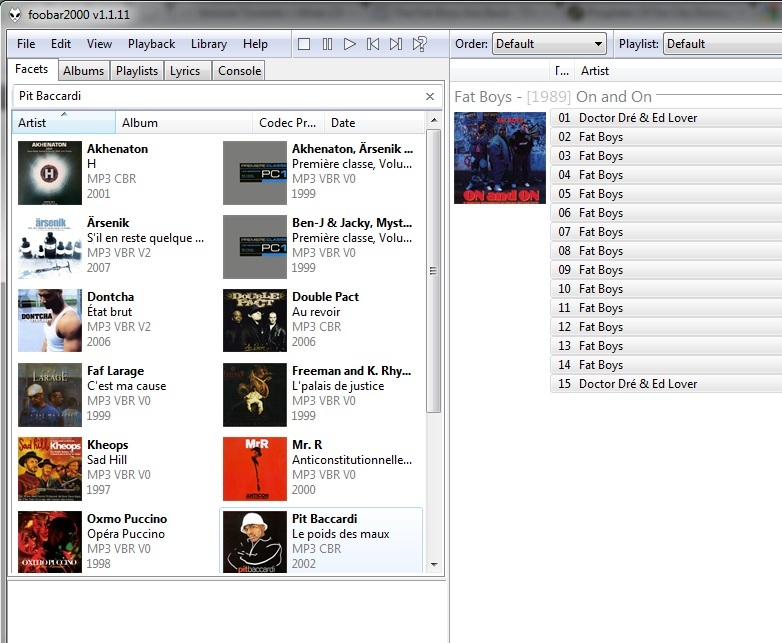 For example, if I have 10 albums by The Beatles, it shows "The Beatles (10)", just like in the default media library? Not sure if anyone can assist with this, I have an album tagged with two different artists separated by a semi-colon. Now I would like to show this album under each artist in an "album artist" pane. At the moment I instead get a separate entry for both artists, in a addition to the individual entry of each artist (see yellow highlights in screenshot below for clarification). Is there a way to get my desired layout which does not have the third, combined artists entry? Probably this (http://wiki.hydrogenaudio.org/index.php?ti...ltivalue_fields) might help you. Thanks! That seemed to have worked, although now the artist art doesn't display for the two artists in question. Is this a bug? I'm not quite sure, but I think that's because the artist picture is now not unique any more... But that's only a guess. Yes, I think you may be right in that respect. Although it seems silly to treat them as not being unique as isn't that the whole point of a multi-value field? I'm not sure whether this is something facets-related though or whether it's something to do with the foobar core. I am experiencing a crash problem similar to one posted earlier in this thread. When playing from the Library Selection Playlist, if I attempt to search or switch the selection using Facets, the entire UI freezes, when playback of the track continues, and the foobar2000 crashes completely shortly after the track ends. So basically it is unusable. This ONLY occurs during playback however. I am too getting the same problem, earlier it was working fine with the same version of foobar( the latest stable one). just resolved it somehow, actually previously i was using playlistorganizer and it didn't swithiching playlist and suddenly freezes, Now after switching to simplaylist manager problem resolved. WOW - one of the best available plugins for Foobar - thanks a lot!